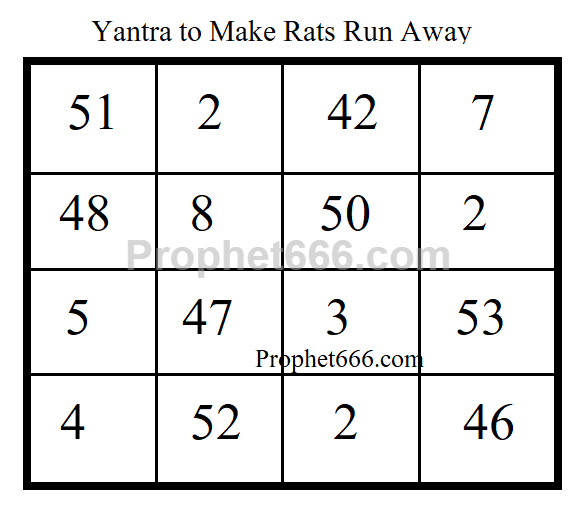 This Sankhyatmak Yantra, which comprises of specific numbers does not need to be infused by a Mantra or Prayer and there is no religious ritual connected to this Yantra. As per the Tantra, this Yantras is said to work as mice and rats repellent. It can be prepared and used on any day and there is no need to wait for any auspicious occasion or Shubh Muhurat or Shubh Tithi. The Yantra can be prepared on white colored paper and written with any kind of ink, please refer to the image of the Yantra shown below. Then, it should be kept in the place where you store your food grains, like your kitchen or store house. If you want to use it to protect your farm from rodents, then the Yantra has to be pressed inside the ground. 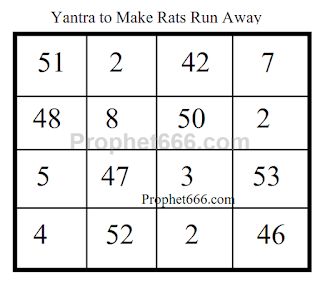 Multiple Yantra can be used if the rats and mice are damaging your property in more than one place in the house or farm. The numbers of this Yantra can also be written in the Devanagari Script. You can also seen the section on Protection Mantras and other section of this site for more Remedies to protect yourselves against all kinds of animals, insects and reptiles. Can this be used for lizard?